Brooklyn gardeners from Coney Island to Canarsie are still feeling the impact of Hurricane Sandy. Coastal flooding and fierce winds damaged not only homes and businesses but also trees, gardens, and green spaces. As flood-damaged areas are restored, coastal gardeners can plant smarter and stronger with a little knowledge about the effects of saltwater on soil and plants. Here are some tips for mitigating damage and creating resilient coastal gardens for the future. If many of your plants are dead or dying, it’s likely the result of saltwater flooding. This may affect both plants that initially survived the flood and any that have been planted since. Sodium in saltwater damages the soil particles (aggregates) that help create the space for air and water necessary for healthy soil. Sodium also pulls water out of plant roots. If enough roots dry out, the plant can die. Even surviving plants will be less drought tolerant in coming years because of root loss. Some effects of salt damage, such as browning foliage, can appear immediately. But some damage to leaves, roots, and buds will appear much later. Salt also kills or repels the beneficial soil organisms that contribute to healthy soil, and thus, healthy plants. Not sure if your garden was flooded? Have your soil tested for its “soluble salts” level. Most landscape plants require salt concentrations below 2000 ppm. See our tip sheet Testing Your Soil for more information. Rain eventually flushes out most of the salt, but without some TLC, the soil may remain damaged. Salt-damaged soil also erodes more easily than healthy soil. Take steps to restore your soil to good health. Avoid chemical fertilizers. They add the very salts that ultimately damage soil structure and speed soil erosion. Add a one-inch layer of compost to your garden beds annually. Doing so will strengthen soil structure and retain water where plants can use it. Don’t leave soil exposed to the elements. Like a forest floor, the surface of a garden should be completely covered. Consider planting groundcovers, vines, and grasses in bare areas or covering them with mulch. This also conserves water in the root zone. In fall and winter, mulch dormant flower and vegetable beds, or plant a cover crop to keep soil in place. See the tip sheet Using Mulch for more information. Follow nature’s lead and plant some of the same salt- and wind-tolerant plants that have adapted to live along the seashore. Find the beauty in coastal plants.These choices may look more “wild” and less manicured than what many gardeners are used to, but they are strikingly beautiful when included in a garden. Plus salt-smart gardeners are willing to adapt! Plants native to New York’s coastal ecosystems aren’t guaranteed to survive a flood, but they are especially well adapted to local conditions and are often very easy to grow. In addition, planting them helps preserve biodiversity, connects us with our natural heritage, and supports native wildlife. 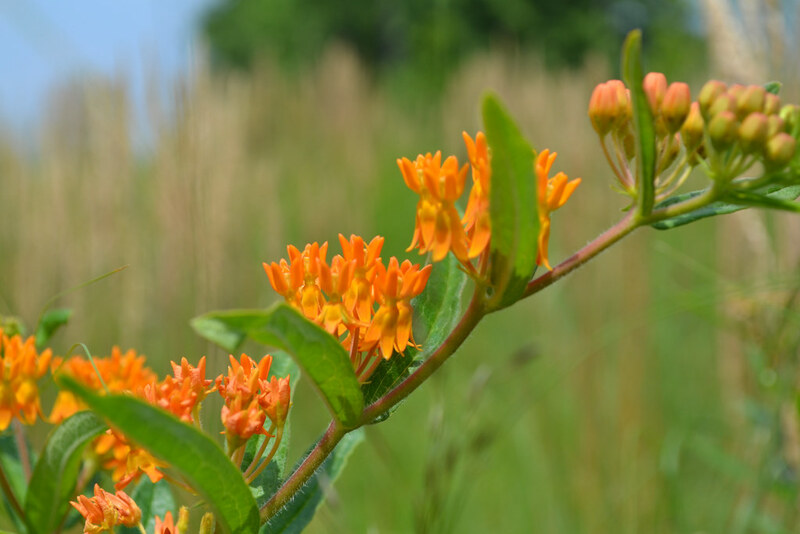 American beach grass (Ammophila breviligulata), butterfly weed (Asclepias tuberosa), and beach plum (Prunus maritime) are some options to consider. Small trees stand up to wind better than larger ones. Existing large trees should be inspected regularly for weak or damaged branches. Use proper pruning techniques to keep your woody plants structurally strong. See the tip sheet Pruning Small Trees & Shrubs. Lose the lawn. There are many alternatives to typical lawn grasses that are beautiful, low maintenance, salt tolerant, and more water absorbent. Consider bearberry (Arctostaphylos uva–ursi), Canby's mountain lover (Paxistima canbyi), or Virginia creeper (Parthenocissus quinquefolia). Be patient. With time, these salt-smart and water-wise techniques will bring your garden back to health and prepare it for future storms. For more information, see Brooklyn Botanic Garden's community greening tip sheets and the following resources. Asclepias tuberosa (butterfly weed) on the Visitor Center's living roof. Photo by Blanca Begert.